The black-sand beach is approximately 35km northwest of Kuta and Seminyak, and a 14km drive west from the provincial capital of Denpasar. 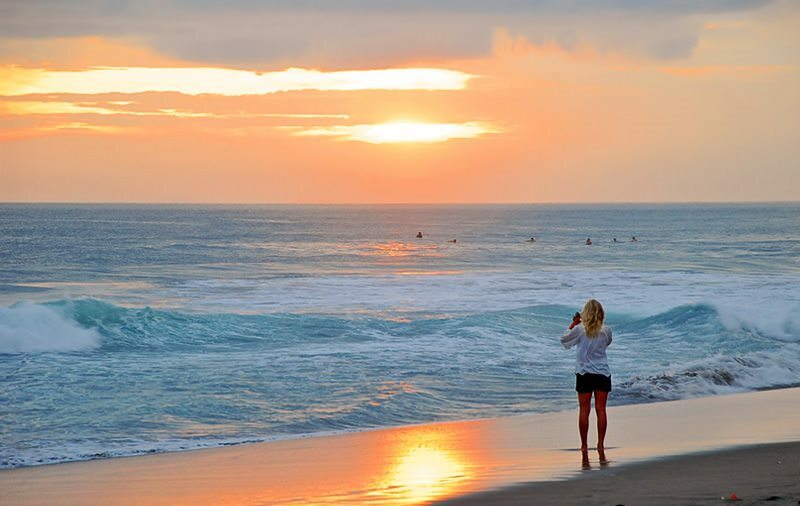 For those staying in one of the many luxury villas in Canggu, such as The Bali Dream Villa Resort, Ametis Villa and the LV8 Resort, this coastal region can be reached by a 45-minute transfer from Ngurah Rai International Airport in Tuban, South Bali. Past the upscale area of Seminyak, the journey further west takes you to Canggu’s green expanses of paddies, which remain well-kept and tended to by local Balinese villagers. Echo Beach is at the end of Jalan Pantai Batu Mejan, the road originally named after the temple there, but which now has more signposts bearing its new nickname. Before a Balinese-style gateway that opens to a glimpse of the horizon are rows of shacks with surfboards for rent, ding repairs, and a motorcycle parking spot. Sunset dining spots line the paved alley left of the gate, starting with Sticky Fingers Osteria Italiana, then Sate Bali, Dian Café, and the Echo Beach House which is responsible for its moniker. 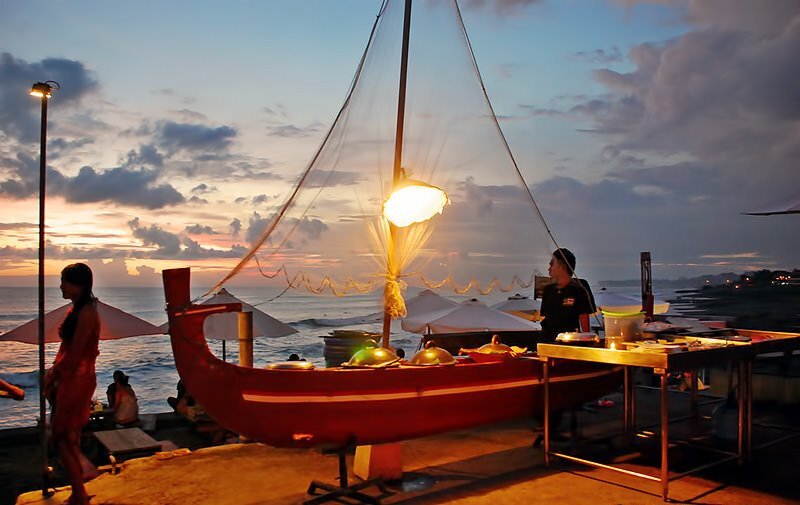 While most open during the day, many come to life a little later with barbecues and unique boat-shaped buffets at sunset. At the far end of the cafes you will be able to see the outline of the centuries-old temple. The temple and the cafes sit on a small cliff overlooking the surf, and the black-sand beach is accessible down a few steps to the right of the gate. A hundred metres along the coastline and set upon the low-lying rocks is Sand Bar, parasols and colourful beanbags await you for great chill-out sessions. While the coast is excellent for sunbathing, leisurely strolls, and surf and landscape photographers, the waves of Echo Beach are strictly for advanced riders. 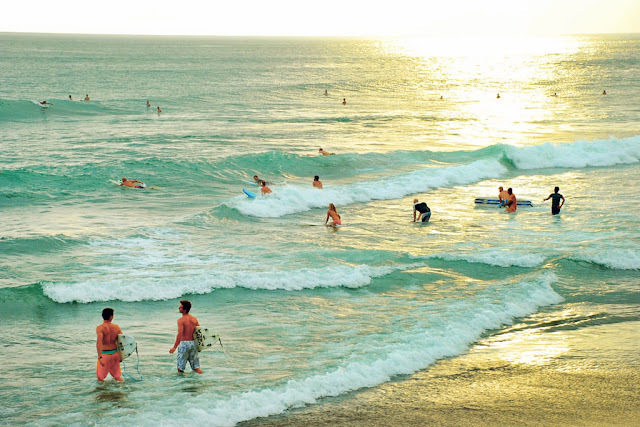 Surfers dominate the scene by day, before shifting to a more ambient dining scene by night. The beach is clean and well-kept, the result of the joint efforts among various surf schools and clubs along Canggu’s coast, which carry out routine beach cleanups along its kilometre-length. 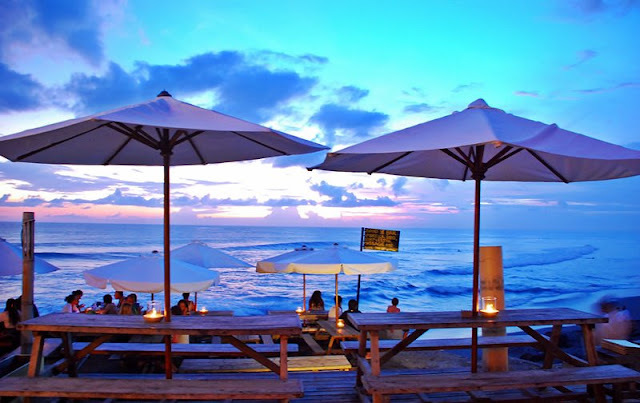 To sum up, Echo Beach serves as one of the island’s best surf spots, and a great place to chill with a laid-back vibe, great views, and delicious seafood.